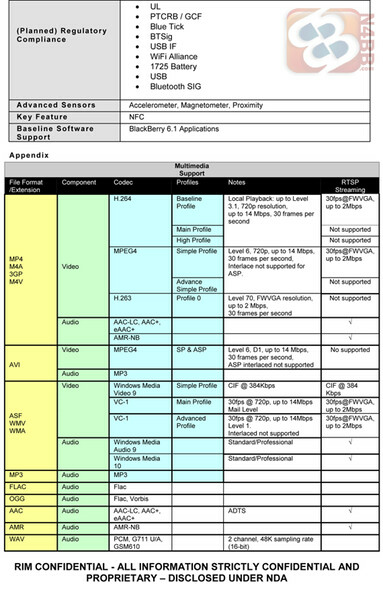 A leaked spec sheet for the BlackBerry Bold Touch Dakota reveals that the phone will be humming with a 1.2GHz Snapdragon processor on board. With a 2.8 inch LCD VGA display and a 35-key QWERTY keyboard, the handset will be another attempt by RIM to compete with the Apple iPhone and Android handsets. Besides using a touchscreen, an optical keypad will be available to navigate the screen and a 5MP camera on the back, equipped with flash, will capture video in 720p. 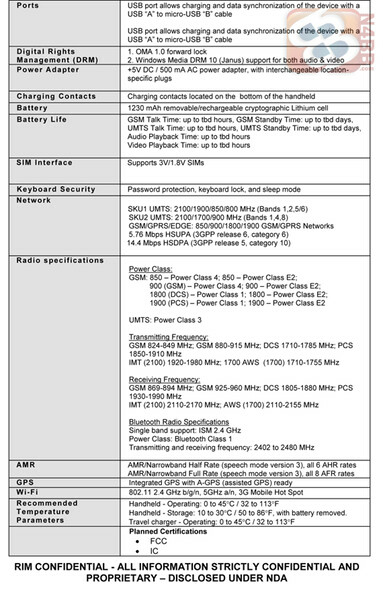 The BlackBerry Bold Touch Dakota will have a 1230mAh battery although talk and standby times were not yet determined. The device is expected to have 8GB in internal storage with 768MB of RAM on board. Earlier today, we showed you a picture of the BlackBerry Torch 2 with it's upgraded VGA screen and 1.2GHz processor. It would seem that the BlackBerry Bold Touch Dakota will have similar specs in a more traditional BlackBerry form factor. 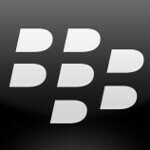 Just good to see Blackberry join the party finally, and give it's loyal following a shot in the arm. what about the 768GB RAM?????? hahahahaha! (GIGABYTES REALLY)!!! hehe pay attention guys! 1230 battery. 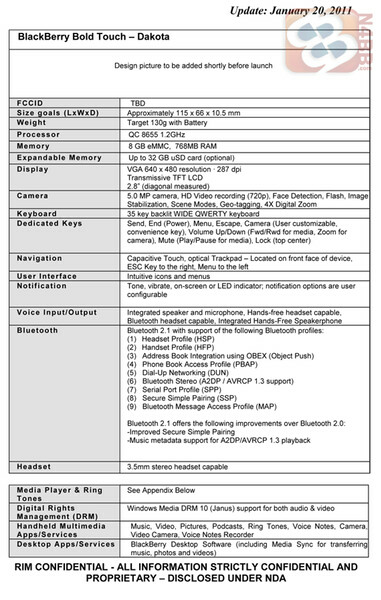 The specs list shows the 1230mAh battery but if you go down to the to the planned Regulatory Compliance box, you the Battery says 1725mAh. really!!...2.8??? is BB imagining too much to think that display size will attract any media enthusiast? ?...only BB fan-boys will be the takers for this one as well just like the original torch! Not a typo. BB/RIM will be including a magnifying lens to be able to better see the screen.... But if you think about it, BB/RIM have been trying to target the 'younger' (aka less sight challenged) generation. A 2.8" screen is a handy way to de-select the 'older' users.